In mid-June, we had the opportunity to strengthen once again our partnership with ASPHER. A Working Group led by Jo McCarthy has been giving opinion and advice on the first two areas of work. As a key stakeholder, EuroNet was invited to the expert meeting held on the 19th of June in London. 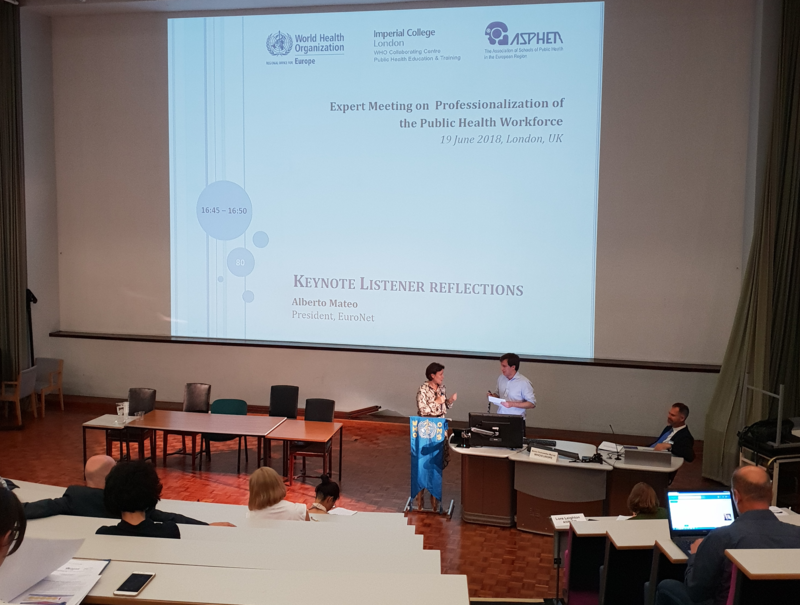 In there, different experts and stakeholders from across Europe discussed the way in which the public health workforce can achieve the same degree of professionalization than other medical specialties. We also discussed the common framework of competences that a public health professional should achieve and what would the accreditation process. Three Euroneters (Damiano, Damir and Alberto) participated in the key discussions led by ASPHER and WHO senior public health professionals, such as Katarzyna Czabanowska, Anna Chichowska or Jose María Martín Moreno. It was a very productive meeting in which we were strengthened our commitment with this project. Alberto had the opportunity to share his insights as a key note listener at the end of the day. Also, Damir Ivankovic, as a member of ASPHER’s executive board, stayed in London for the rest of the week participating in the ASPHER retreat. As usual, we used our visit to London to visit euroneters around the world. In this case, we had the opportunity to visit Diogo, from Portugal; and to share stories, views and public health opinions whilst enjoying a pizza in central London.